This small, modern space caters for well-heeled clientele in stylish surrounds offering all day brunch affairs that will tantalise and pamper the palate. The menu leans towards contemporary and tapas style dining with popular choices such as Salmon, avocado and perfectly poached egg on to die for coconut bread is must try. Brunch selections range from boiled egg with toast soldiers to gourmet open sandwiches supplemented by delectable tapas, gourmet salads and lunch specials such as luscious white wine and chicken risotto or seared beef fillet. Indulge further with delicious walnut loaves, or date bread and silky cupcakes from the take away menu. 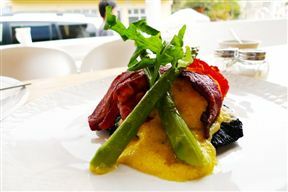 Manna Epicure is 1.6km from the centre of Cape Town , the nearest airport 21.5km (Cape Town International Airport).